LiveCode LessonsLiveCode LessonsHow to - LiveCode Marketplace Products Data Grid HelperHow Do I Create a Checkbox in a Form? This Lesson presents how to create a checkbox button in a data grid form, using the Data Grid Helper Plugin. 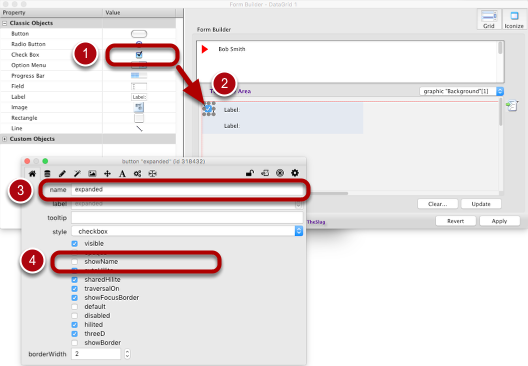 and will consist to show you how to replace the arrows images by a checkbox button. 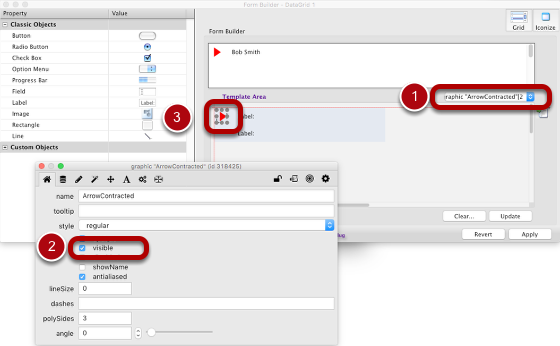 Double click on the Data Grid to open the DGH plugin, then click on the "Form" topic inside the DGH properties window. 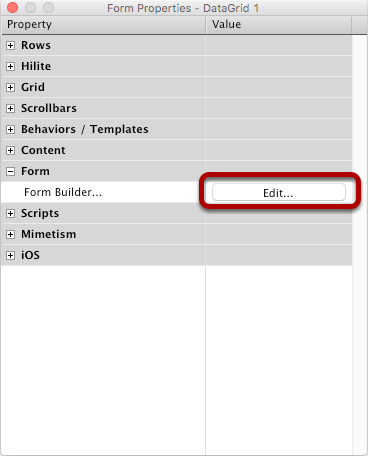 Click on the Edit... button to open the Form Builder. 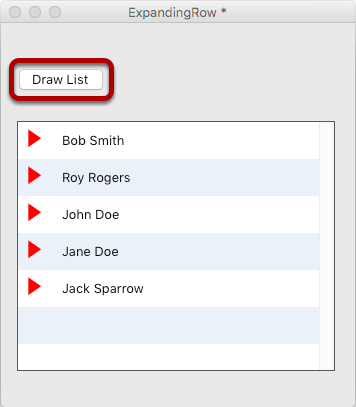 Clicking on the "Draw List" button populates the Data Grid and will allow DGH to display a preview of the Data Grid in its Form Builder. Double-click on the ArrowExpander image to open the LiveCode Inspector. We will need the Inspector for deleting the ArrowContracted image which is not visible by default. Click again on the ArrowExpander image to give the focus to the Template Area, then press the delete key on your keyboard, to delete the graphic. Use the Controls Popup (1) for selecting the "ArrowContracted" graphic. The graphic is "invisible" by default. 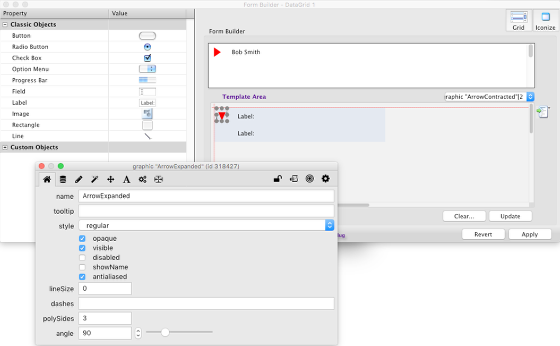 Chek the visible property checkbox (2) in the LiveCode Inspector. The graphic is now visible. Click on it (3) to give it the focus, then press the delete key. We are now ready to add and position a checkbox in the Data Grid template. Use the mouse or the arrows keyboard keys to place and dimension the checkbox the exact location and size you want. To reflect the template changes, we have now to edit the script. Click on the "script" button and select the "Edit script" menu item. In the Script Editor window, click on the "apply" button, to save the script and close the window. When DGH is opening the Script Editor it reduces itself as a small palette, so we need to revert it back at its original size. For doing this, click on the open button, then DGH will display the Column Editor. Click on the Update button (1) to apply the script changes to the Template Area preview (2). Before applying the changes to your project Data Grid, you can checked all is working as expected by using the Template Area preview. 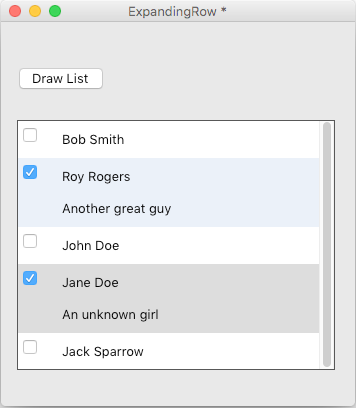 By checking the checkbox (1), the line expands with no error. We can consider our job, done, and then click on the "Apply" button (2) to apply the changes to the project Data Grid. That's it, our Data Grid form is ready to use! Next: How Do I Change the Sort Arrow Icon Of My DataGrid?